After nine years of watching numerous runway shows - locally, two fashion weeks each season plus five design school shows as year - as well as trips to Couture Fashion Week in New York and Montreal Fashion Week, it's hard to surprise me. But when a designer does it is a wonderful thing. 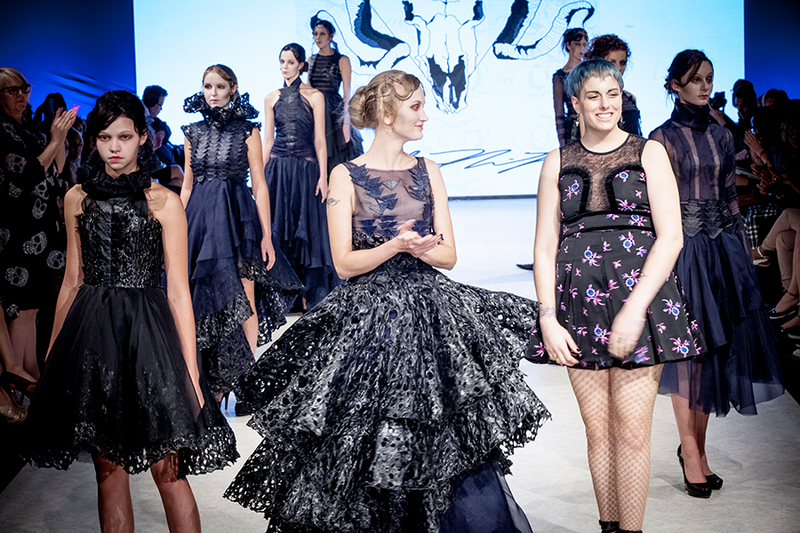 That very thing happened on Wednesday at Vancouver Fashion Week (VFW). And it was the opening show. I gave it a standing ovation. Only one standing? Who cares! It was well deserved. The designer was Amber Nifong. A day later I found Nifong in the showroom upstairs. I had to touch every dress and talk with her about the crazy, hole-y, melted lava looking black structures she created. It was a shock to learn it was a heavy weight lycra she hand-melted one hole at a time. The sheer number of hours this process took were enormous. I used to sew dance costumes and went through hundreds of metres of lycra a season. Oh the crazy designs I could have offered had I known. Others offered intricate leather detailing. And then there were skirts of floating chiffon. The entire collection contrasted hard and soft. The welcoming, beautiful smile you see on the designer's face above, also held in person. It was a pleasure speaking with her. She was easy to approach, happy to share about her work and humble - all qualities that bode well for her future in the industry. I left totally inspired and wanting to see more. That sealed the deal for me. I wanted to feature her in a solo article. I think this is the first time I have offered a separate piece on a recent fashion grad showing their thesis collection on the runway at VFW, but it is well deserved. I hope you are as intrigued as I am. And Amber - I have my eye on you. Keep in touch and let me know what you're up to. I can't wait to see what you bring to the fashion world next. I was born in Winston Salem, North Carolina (USA), but grew up most of my life in High Point, North Carolina. What where you like as a kid? As a teenager? Like most artists I was always a little different. As a kid I loved playing outside, pretending, drawing, and reading. My parents joke that they couldn't ever punish me as a kid because if they put me in "time out" I was perfectly happy to just sit there because I would pretend to be a princess trapped in a castle or something of the like. I grew up in a more rural part of North Carolina, so I loved going hiking, playing outside, climbing trees, and running around on my grandparent's cow farm. As a teenager, I was a brainiac. I definitely didn't fit in with my peers. I was extremely driven, a straight A student who was obsessed with perfection. I was at the top of my class and took the most advanced courses possible. I did theatre back then so that was always a fun creative outlet for me. I miss it to this day. I pursed my artistic and fashion endeavors with just as much rigor as my academic ones. I took fashion classes at a local art collective, I did a 6-week pre-college summer program at Rhode Island School of Design (RISD), and took college level art classes my final year of high school. Looking back, is there a story from your childhood that hints you would pursue a career in fashion/arts? Oh yes. When I was in the third grade, probably about 8-9 years old at the time, I had all sorts of sketchbooks. I distinctly remember having one with my designs in it, fully colored and everything. And at the top of the page above the designs, I had price points for the clothes. I had "customer prices," they were about a whopping $25 (which I thought was a fortune at the age of 8), and then I had my "family discount" prices. Those usually ranged from $5-$10. To this day that memory is still very vivid for me. Talk about when and how you officially decided to pursue a career in fashion? Where did you chose to study and why? I had known forever fashion was all I ever wanted to do, but I started visiting colleges and looking at fashion design schools at the end of my sophomore year of high school. I had the schools narrowed down to RISD and Savannah College of Art and Design (SCAD). I ultimately chose SCAD, because they had an impressive fashion program with heavy hitters like Andre Leon Tally on the board of directors. They also had very good job placement and alumni success rates compared to other schools, which was important to me even at 18. Not to mention, I also just fell in love with Savannah. It was this stunning antebellum town with live oaks, ghostly Spanish moss, and a vibrant mix of people. I moved to New York recently and I definitely miss it. What was hardest for you in design school? What came easiest? Could change that to hate/love if easier. I think the hardest thing for me in design school was the long hours. Anyone going into fashion knows the hours are long, but for my senior thesis year, the amount of hours and work myself and my peers did was brutal. It probably took at least six months after graduation to recover from the stress, lack of sleep, and exhaustion I had put my body through to finish. It's hard to say if there is a way to change what I found to be the hardest at SCAD, which were the long hours and grueling work schedules. Some of that was brought on by me, due to the complexity of my designs and my obsessive need for perfection. More sleep would have been nice, but I also think it helped prepare me for the industry. Once you've been through the worst of something, everything else seems to not be so bad. One of the easiest things that came to me at SCAD was the academic courses. A lot of people tended to complain about art histories or the like. Which is understandable considering a good portion of artists don't always thrive with conventional types of education. However, since I had always been a book worm and very academically inclined, I thoroughly enjoyed the academic courses. Talk about the collection you showed on the runway at VFW - inspiration, concept, fabrics, the fascinating journey creating that holey fabric, title, etc. The name of the collection that I presented at VFW was called "Ange Déchu" which means fallen angel in French. My collection was based on the idea of darkness — especially inner darkness and struggle. Society as a whole tends to bottle up, push away, and ignore its darkness — our battles within, our demons, the things that make us lie awake at night. It's not a pleasant subject and is an uncomfortable topic for most. However, I wanted to take a look at our demons and the darkness that is within all of humanity and place it in a different light. I wanted to show that darkness and anguish can be beautiful. I know personally in my life, the hardest trials and the darkest times for me are what have shaped the person I've become, and have been what have ultimately made me beautiful. I wanted to show that these could coexist together, and that even our darkest parts can be exquisite. That's why the collection is named Ange Déchu. In biblical texts, fallen angels, specifically Lucifer, were some of the most beautiful creatures in heaven. Lucifer was described to be the most beautiful out of all the seraphim. This did not change when he fell from the favor of heaven. Much like these dark angels, I wanted the collection to express the paradox that dark things can be terrible, yet beautiful all at once. In terms of the fabrics I used, I mainly utilized three different fabrics — silk organza, leather, and a nylon spandex tricot. I created an almost all black collection, utilizing texture, fabrication, and juxtaposed design elements to create interest and to keep the collection from looking monotonous. The one question I tend to get the most in terms of fabric is, "What is that weird holely fabric?" That fabric is one I created via some interesting fabric manipulation. The fabric is a heavy nylon spandex tricot. It gets it's unusual look and texture from being set on fire. I hand-burn every piece with a torch. This process melts the fabric and subsequently creates the unusual texture and look of the fabric. Although the fabric looks delicate, it is extremely durable. Because nylon spandex material is synthetic, it melts when burned, thus plasticizing the fabric. What are you plans from here - 6 months, year, 5 years? My plans for the next six months to a year moving forward are to continue applying to jobs as an assistant designer at higher end companies and securing a position. Once I have a more regulated schedule, I plan to continue to work on building my brand and doing more ready-to-wear focused designs in my free time. In five years, I would really like to be trying to pursue my own company under my own label. I have only been out of college a little over a year, so I want to garner more industry experience both from a design and business perspective before I make the move to begin a company. So that dream is still a little bit further down the line, but I plan to make it happen. What 3 things would you like people to know about you? Hmmmmm, that's a tough one. I feel like I'm always talking about myself as a designer, so perhaps I shall share some facts that are a bit more telling of myself as a person. First off, I love writing. I write a lot of free verse poetry and a lot of my musings on life. I post it to my blog on my website, but I'm not sure how many people actually read it. I am very at ease and confident when it comes to talking about my design abilities and presenting concepts, but I do tend to get very nervous about my writing. I guess because it's just something I do for myself, and I am more self-conscious about it since it is not something I've particularly studied. Another thing to know is that I am a huge people person and extrovert. I find people fascinating and I love hearing about their journeys, perspectives, and what their walk in life is like. I think the human connection is very important. Living in the digital age has many benefits, but it has its drawbacks too. I feel like people don't really connect as much anymore. Too often I find that people talk at each other rather than talking with one another. I'm notorious for striking up conversations with random strangers, and I will more likely than not touch on the "taboo" topics of conversation upon first meeting people, like religion, politics, and existential views about life. The final thing I think I would like people to know is I'm somewhat of a closet nerd. I love reading about science, especially quantum physics and string theory. I enjoy learning about anything bizarre and unusual. I adore doing research on obscure topics or reading about new medical advances and the like. I also am a HUGE Lord of the Rings fan, and probably have a bit of an obsession over those books. Let's just say if I could be an elf in middle earth I totally would. The only other thing I would say is, to keep a look out for new stuff coming soon to my site! I will be uploading new photos and videos from my VFW show, new process photos and sketches, as well as upcoming projects/portfolio pieces. All of which can be found at: http://anifong.com.